Time flies when you’re having fun, which means our Professional Intern Leanne must have been having loads of fun. It feels like just yesterday, but it was in fact on 28 January that now Divemaster Leanne joined our PADI 5 Star IDC Dive Centre here on Gaya island to become a professional diver. 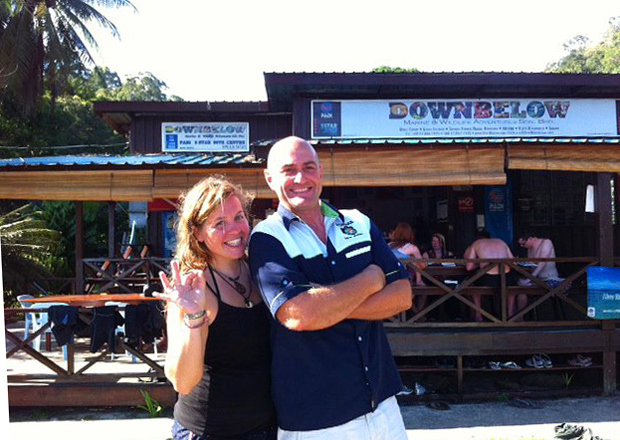 Now, 2 months, lots of diving and plenty of hands-on experience later, Leanne wraps up her Divemaster Internship with with Downbelow in Sabah. The Nutty Northerner, as she’s been dubbed at the dive centre, leaves us as a fully qualified PADI Divemaster with DSD Leadership upgrade. Other than top rated qualifications, Leanne also has 2 months of experience at Kota Kinabalu’s busiest dive centre in her bag of tricks. Having dealt with a daily stream of individuals, small and large groups as well, Leanne is ready to make an immediate and positive impact at any dive centre lucky enough to snag her. We wish her the best of luck and hope to have her back soon when she decides to go to the next level and become a PADI Open Water Scuba Instructor.